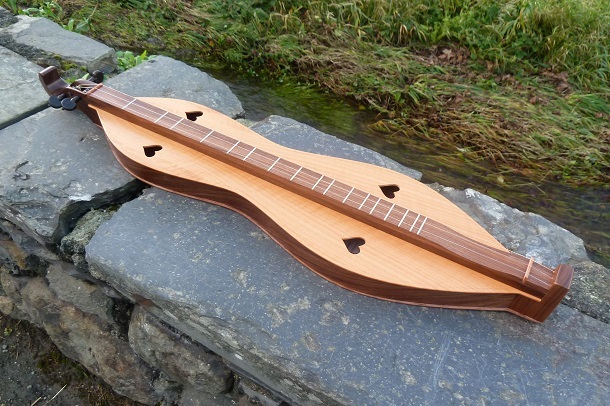 Here is the Irish tune The Meeting of the Waters played on the Heritage dulcimer with a noter and thumb strum in DAA tuning. 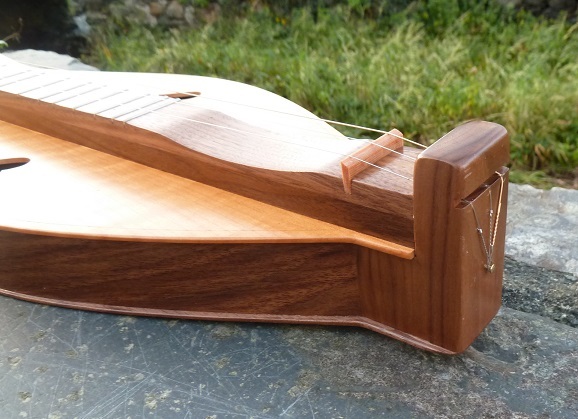 Originally the Appalachian mountain dulcimer was built to be played in the same way as the old 17th century European folk zithers from which it emerged. The melody was played up and down just the string closest to the player, often using a small stick or 'noter' to fret the string. The other strings on the instrument were tuned as sympathetic drones; usually to the root note and 5th note of the scale. Dulcimer makers in the mountain communities built instruments this way for 150 years or so right up to the late 1960s (and some older makers beyond). They would place the frets by ear on the instrument to get the scale sounding sweet and so most of these instruments ended up with scales that blended perfectly with the drone strings. The Heritage Dulcimer has been built by the Chas Hagen in Ozark using selected features from these earlier instruments, particularly from the more well known makers of the 1940s and 50s. The instrument has a wide, shallow body giving volume but limiting the bass response and so balancing the drones against the melody. 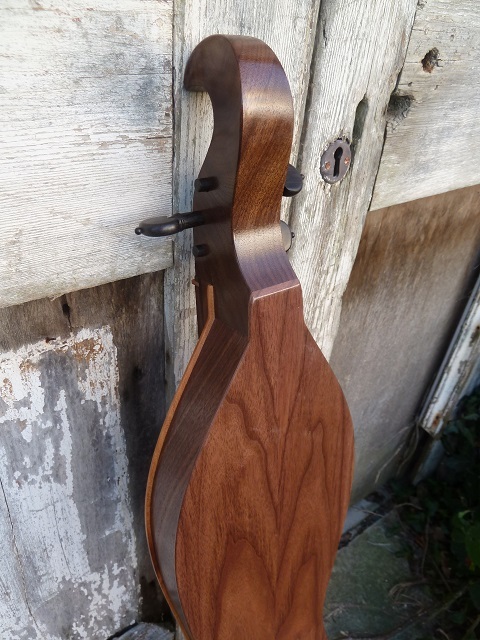 The woods used are regional walnut and cherry with the old style 'fiddle edge' join between the top, sides and back. The fretboard is high and narrow and routed out for tone and stability. The headstock is a classic simple scroll and the tailpiece a high block (suitable for either loop end or ball end strings) both features reminiscent of some of the old Kentucky makers. The instrument is a traditional 3 string and has wooden viola pegs for tuning. The 28” scale length and pure diatonic fret pattern are derived from a pre-revival North Carolina dulcimer maker, who used one of the sweetest fret intonations we've ever played in DAA tuning. 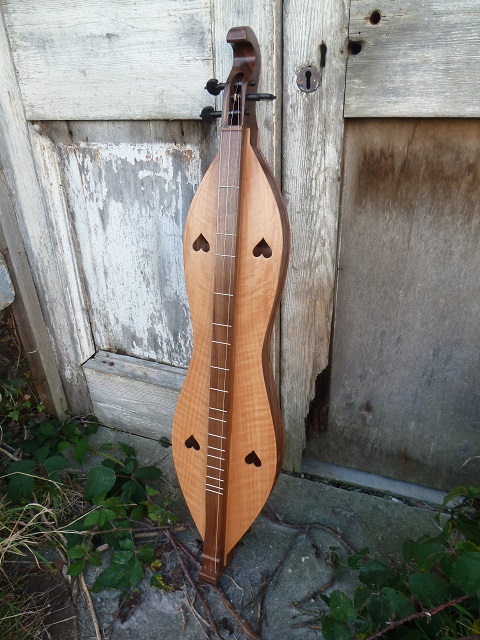 The Heritage dulcimer is a musician's delight. It is very kinaesthetic to play in the old styles, be that with noter and quill or just your hands. It was our love of old dulcimers but inability to buy off-the-shelf anything like them today that was the inception of the Heritage model. And we hope that by making such wonderful instruments available again musician's will rediscover for themselves the joy of the traditional dulcimer. Additionally, the fretboard has nut and bridge slots where the inserts are not glued, which allows the musician to easily change the nut and bridge material, height or intonation should you wish to refine your set-up for your own playing action, string gauges, intonation, tunings and tone. 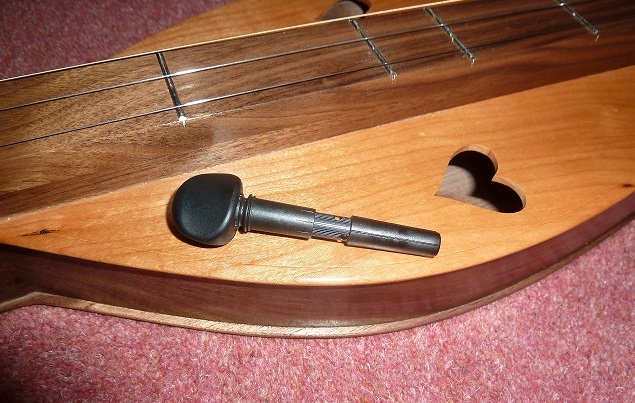 With the standard wooden viola pegs on the Heritage dulcimer it is relatively simple to tune the instrument to itself by ear in perfect 5ths and get everything sounding really sweet (all the recordings here were done on a Heritage dulcimer with wooden viola pegs). However, wooden tuning pegs are not everyone’s cup of tea (or should that be shot of moonshine!) as it can take a little time if trying to tune to an exact pitch with an electronic tuner or if you have to tune to another instrument at a session for example. 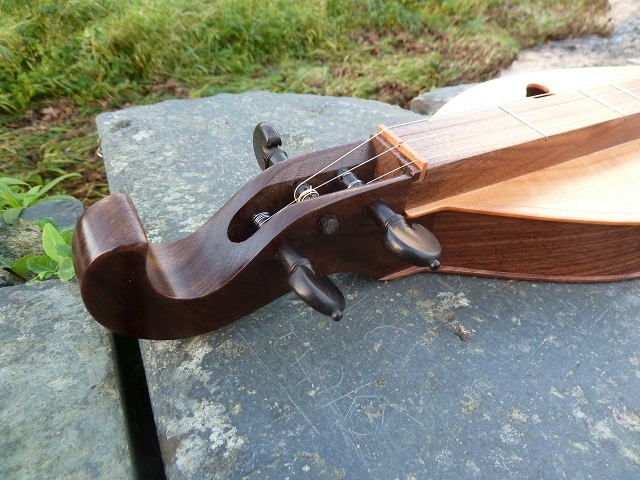 So we have Wittner Finetune viola pegs available as an optional extra; these look like wooden pegs but have a 7:1 gearing system cleverly hidden within. Here is the Welsh tune Calon Lan being played on the Heritage dulcimer with noter and goose quill in DAA tuning.